In her presentation video Sabina Schärer shows how the Hang Gudu is placed on the left thigh. This is the normal positon for right-handed players. Left-handed players place the instrument inversely on the right leg. Playing position for right-handers. Left-handers place the instrument inversely on the right thigh. As aspiring Hang Gudu player and left-hander I had a problem: On my right side there is the hard socket of my above-knee prosthesis. It doesn’t provide a safe position for the instrument, and furthermore, it is clacking when hard sheet metal meets hard glass-fibre-reinforced- plastic. Therefore I thought that I had to place and play the instrument like a right-hander. However, it shortly turned out that I run into problems. For playing I needed extraordinary concentration and yet easily lost the groove. This situation didn’t open up a free space for creative improvisation. After a while I realized the reason for these problems: The handedness is important for playing the Hang Gudu. And players have to pay attention to this demand. 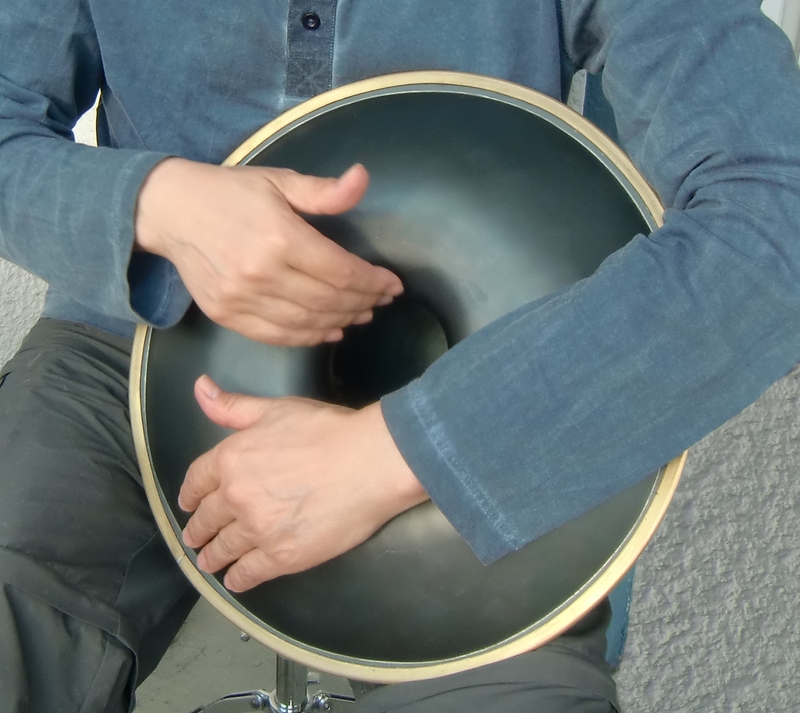 The Hang Gudu player’s hands share the functions to excite sounds and change the pitch. Thus their functions are not so strictly divided than those of the violin player who uses the right hand only for bowing and the left one at the fingerboard only for changing the pitch; neverstheless, there are differences: One hand is more active in exciting the bass pulses of the vibrating air while the other is more active in pitch changing. 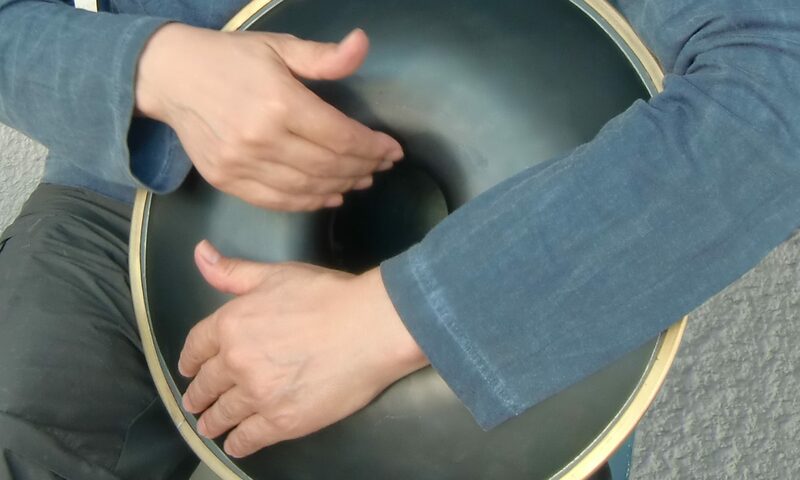 One hand is leading playing the main beats of the rhythm while the other hand is following filling out the spaces between the beats. Therefore I call the one hand the leading hand and the other the following hand (I’m not fully satisfied by these terms but so far I found nothing better). The right-hander’s leading hand is his right hand. The left-hander’s leading hand is his left one. My challenge was to take care of both aspects, placing the instrument like a right-hander but using my hands like a left-hander. Perhaps you have already noticed my solution when watching the video in the preceding post: I exchanged the positions of my hands on the instrument. My left arm is embracing the Hang Gudu. This way the leading hand is reaching its playing area from left below. My right following hand is reaching the instrument horizontally from the side and not diagonally from above as in the usual postion. My playing position as left-hander with the instrument on the left leg: The positions of the hands are exchanged. This transition of my way of playing had a striking effect that occured straightaway. Suddenly my left leading hand mastered the main beats with ease and I was able to let the groove happen intuitively. My problems were not caused by a lack of exercize but only by my attempt to play the instrument against my handedness. However, the exchanged hand positions can have their disadvantages in certain playing situations. Therefore I recommend all left-handers without physical restrictions to cope with their handedness by placing the instrument on the right leg and playing it inversely to the right-handed players. 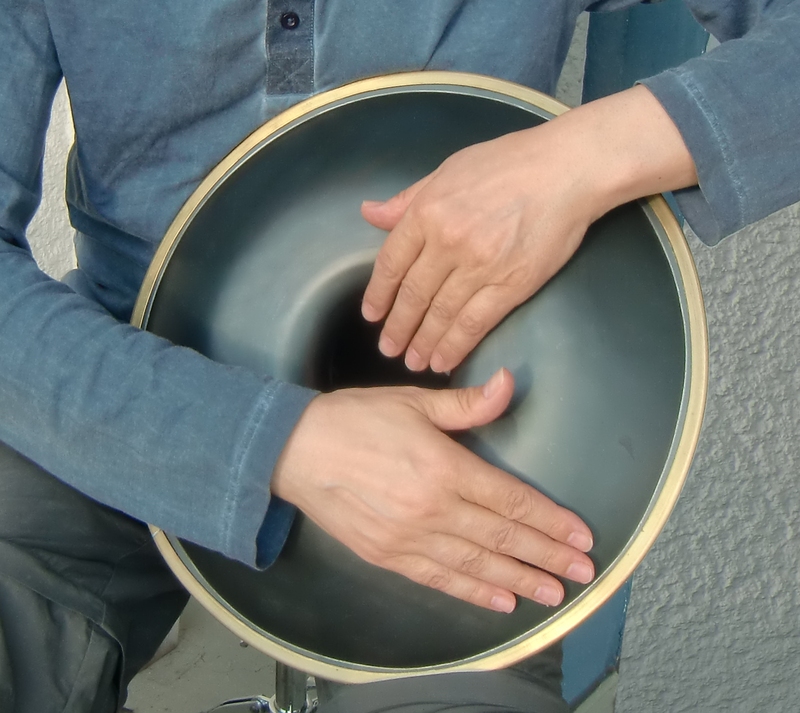 Important for the videos in this blog: When you try to reproduce something with your own Hang Gudu that I am demonstrating in my videos you have to take into account that the positions of my hands are exchanged. Hi Michael Your video gives me new ways and tecniques to to play my Gudu.. Thank you! Great! Fellow leftie over here. I play tabla and my teacher recommended playing whichever way was most comfortable —even if it meant switching the position of the instruments. When I took a daf workshop, the teacher was very surprised to see me playing left-handed! But he also agreed it would be better to play in the way that is most comfortable. Good start to your blog! It’s great to have a community around this 🙂 Thank you very much for the invitation. I favour the right hand and am a AKLL amputee (above the knee left leg); the mirror of your challenge working with the ‘handedness’ question. Your explanation of your approach for accommodating the prothesis socket is very helpful. Thank you. Previous PostPrevious Rechtshänder oder Linkshänder?